To get paid timely for your tutoring service you need a professional tutoring invoice to detail the service that have done and the amount to pay. 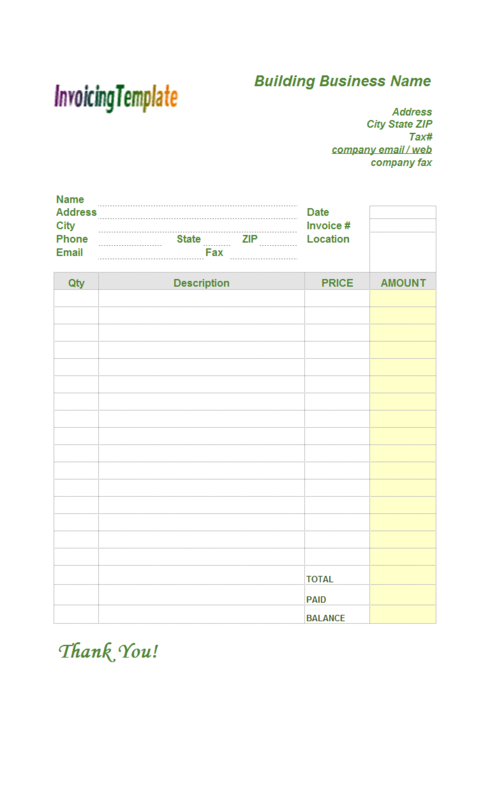 This free Excel bill sample for tutors make invoicing and billing as easy as fill in a blank form. 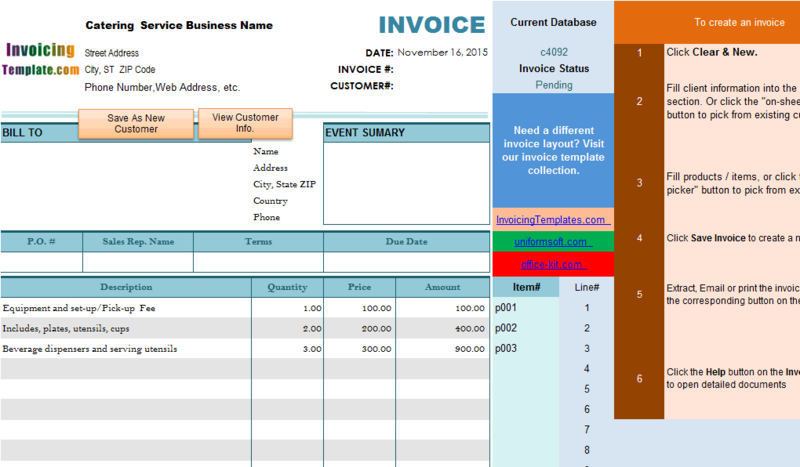 c5079 now includes the customized invoice template for the latest version of Invoice Manager for Excel. This is what you will see when you open tutoring.xlsx. 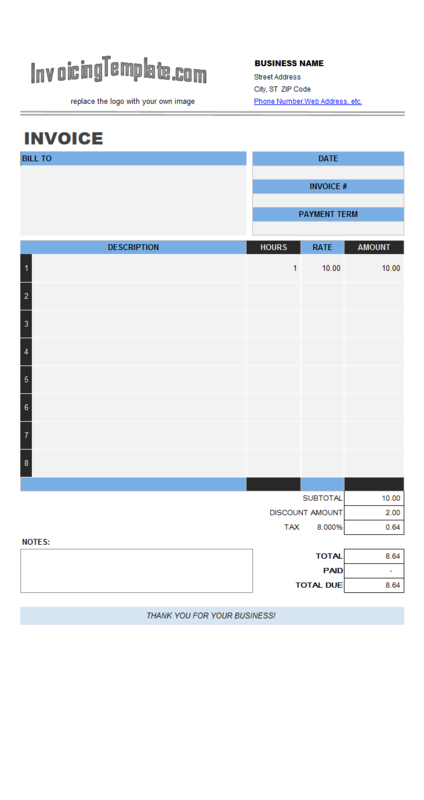 On the top of the tutoring bill template / receipt template, you'll first see a logo image that you should replace with your own logo image. 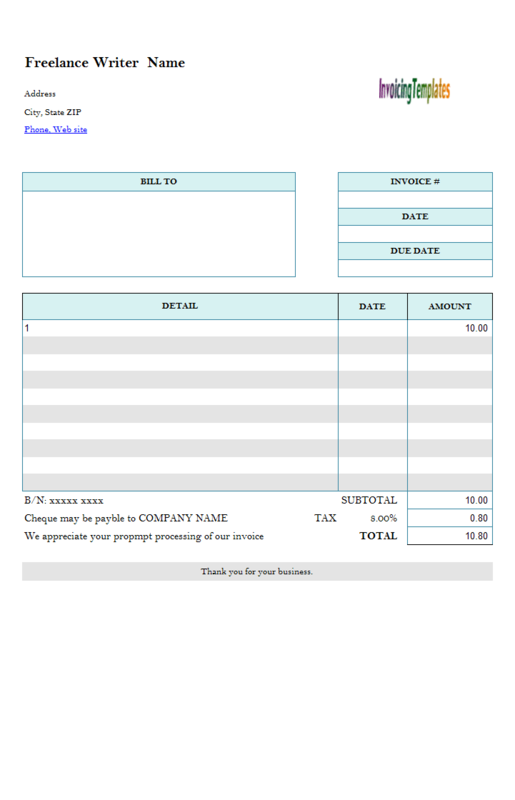 If you have Invoice Manager for Excel (namely Uniform Invoice Software) installed, which is our invoicing software app that helps you tracking your invoices / receipts and payments, replacing the logo image could be easily done by simply clicking "Replace Logo Image" button on Excel "Invoice" ribbon tab. 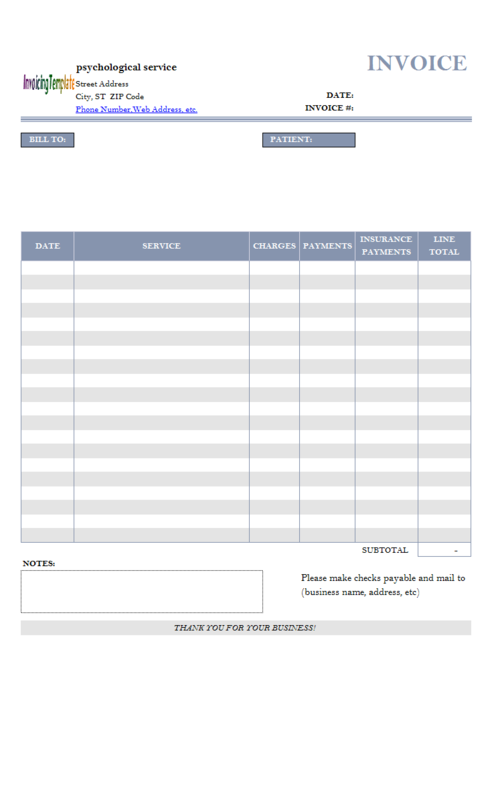 Below the logo image is the section for you to detail your personal / business information, including business name, address, contact information, email and web site address etc. If you are a licensed tutor, it is a good idea to show this fact here. If you collect taxes, the tax# for your business should be added here too. Consulting a taxation professor at your local area for the requirements regarding taxing on invoices or bills. To set the taxing options with Invoice Manager for Excel (namely Uniform Invoice Software), clicking the "Settings" button on the "Invoice" ribbon tab, and then go to the "Taxes" tab. By default, this template has two taxes set, GST and PST. Whenever you click the "Clear & New" button to the invoice form ready for creating a new invoice, the tax names and rates will be filled with the default values set on the "Settings" window. 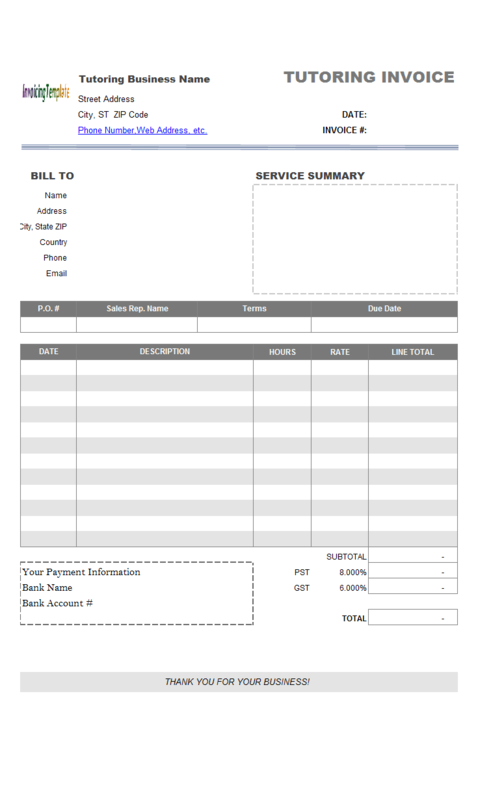 The "Bill To" section allows you to enter the customer / student information. 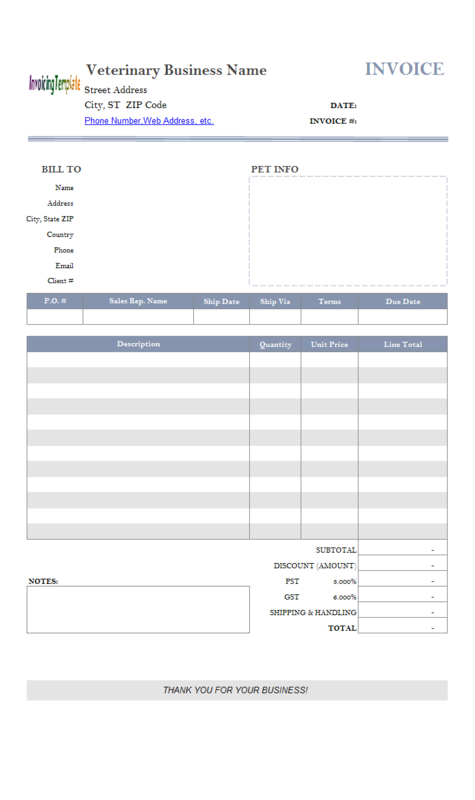 We've moved out the "Customer#" and "Country" fields from this printable form - but if they are need, you can easily move them back into the printable invoicing form, as the sample template shows. To the right of the "Bill To" section is the "Summary" section, where you can provide a brief description of your tutoring service. 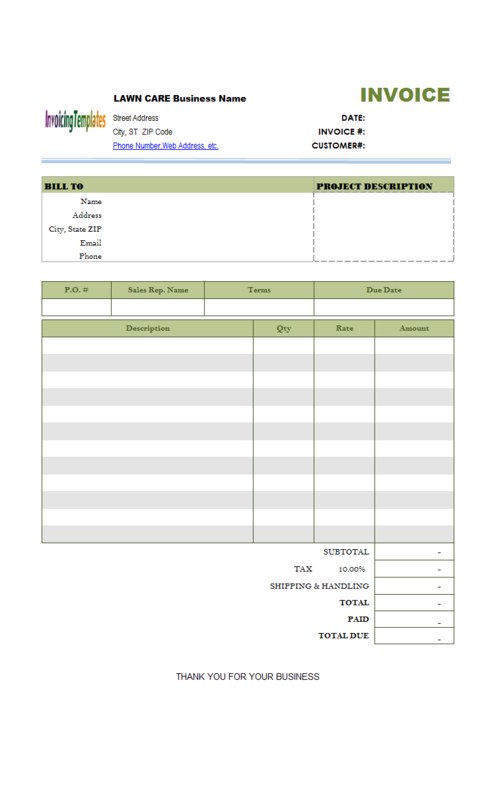 On the invoice body section, there are 5 columns - "Date", "Description", "Hour", "Rate", "Line Total". 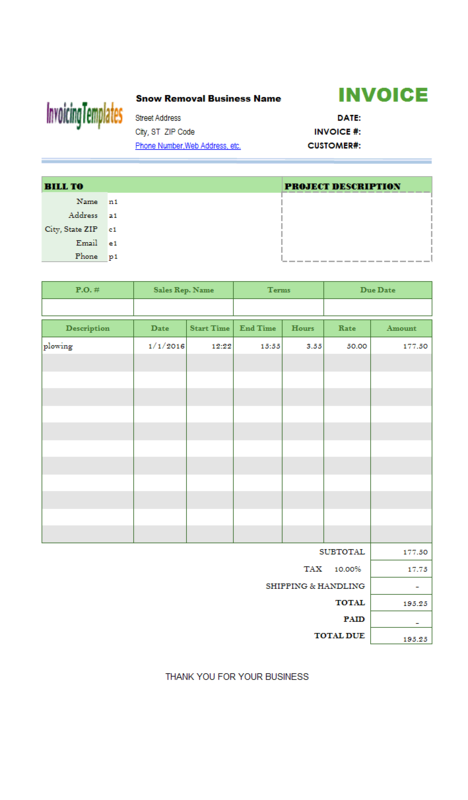 The "Line Total" is calculated automatically using Excel formulas. For example, the first "Line total" cell has the formula like "=ROUND (oknQuantity_1*oknPrice_1, 2)" - meaning the line total is calculated by multiplying the quantity (hours worked) and the unit price (i.e. the value on the "Rate" column). 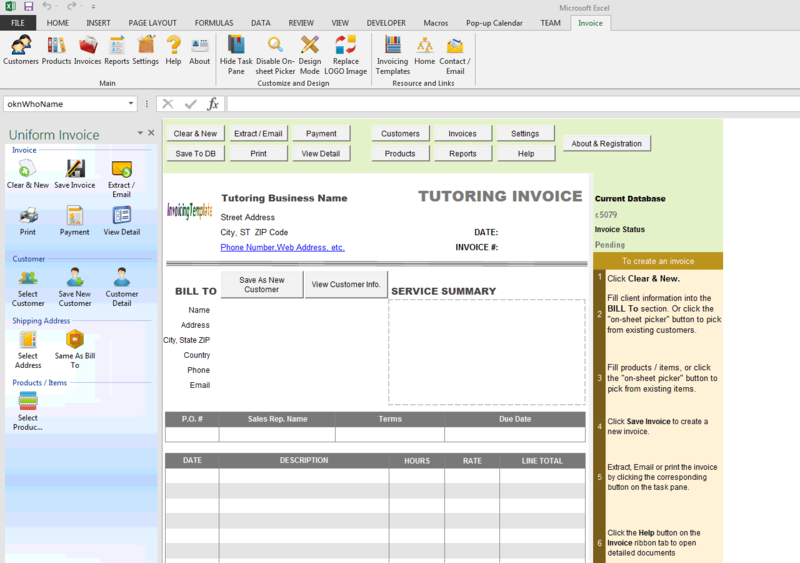 Compared to Microsoft Word, the support of formulas is one of the major advantages of Excel. 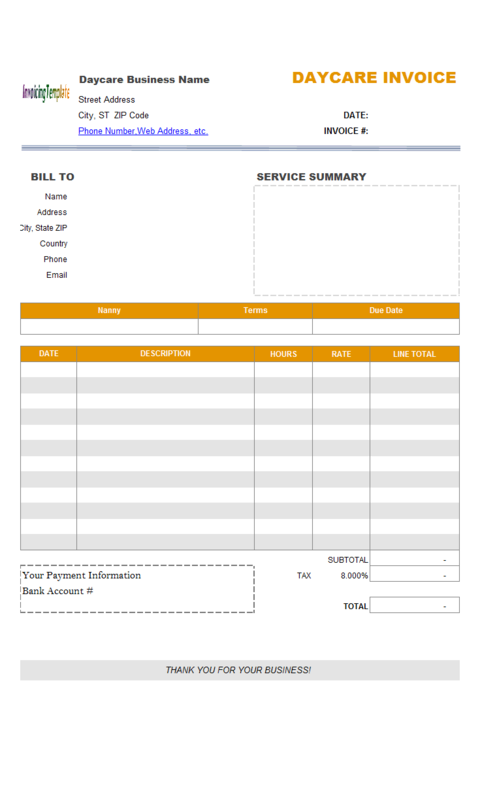 Many service provides bill their customers based on hours and rates. 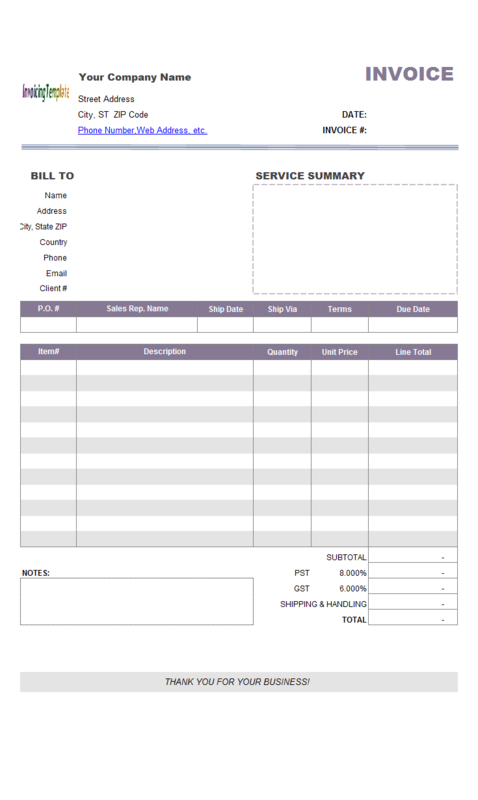 Here on InvoicingTemplate.com, a number of bill template are created for you to choose: Template with Hours and Rate, Beautiful Service Bill Sample Template with Hourly Rate, Billing Samples with Hourly Rate - Top Results, Time Sheet Billing Format, Hourly Service Invoicing Sample, Hourly Service Bill Sample (Price Including Tax), Itemized Graphic Design Invoice. 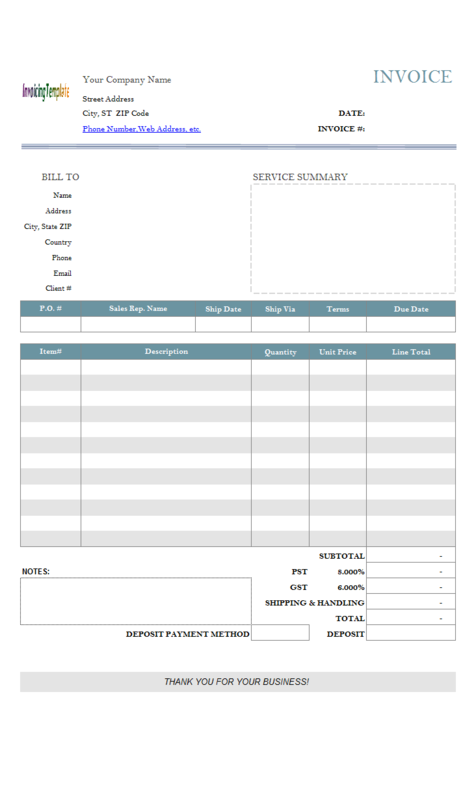 These service billing samples are designed for many different service providers, such as freelancers, contractors, cleaners, consultants, caterers, house cleaners, and service providing companies. If you cannot find a template that match your requirements exactly, remember that our templates are highly customizable. 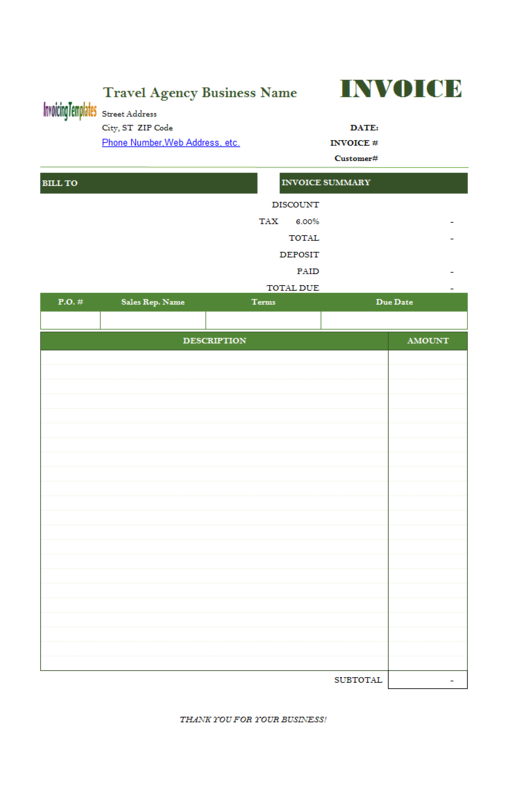 Visit Customizing Invoice Template for the details. 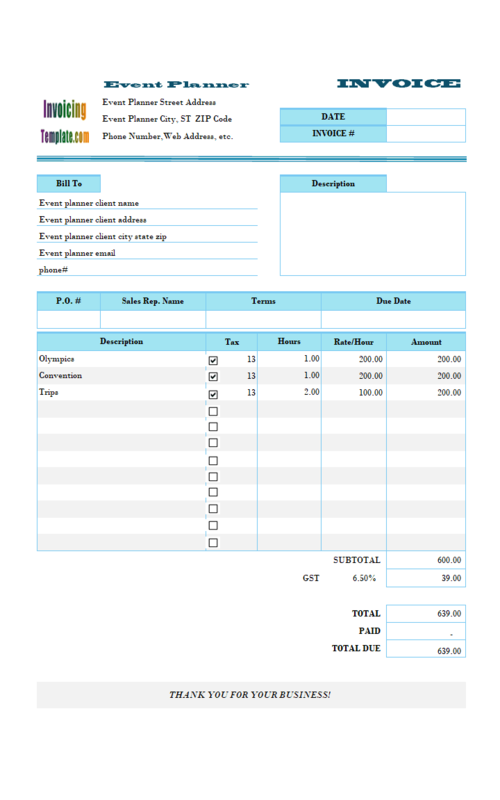 On the bottom of the invoicing form are the summary information, including fields such as Subtotal, Taxes, Discount, Total, Paid, and Balance Due. You may also like to detail your private / personal / business payment information, such as bank name and account#, online payment options etc. 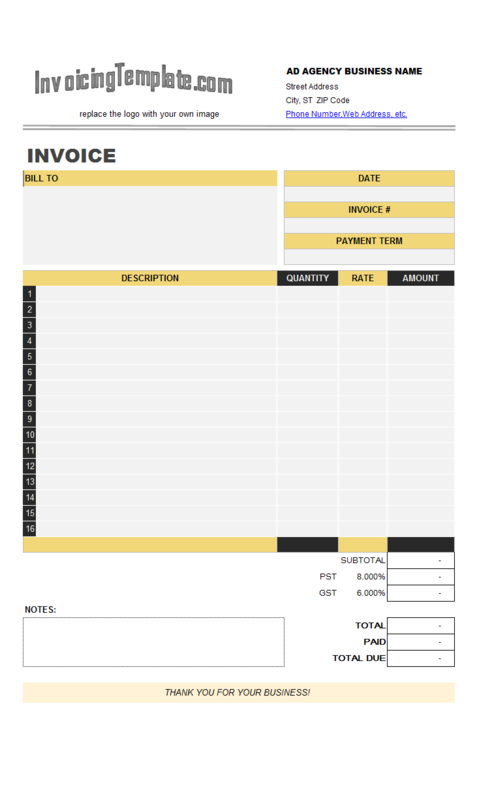 Like other form designs here on InvoicingTemplate.com, Tutor Billing Format is free (offered to you at a price of 0.00USD). It works on Windows XP and all newer versions of Windows, and Excel 2007, 2010, 2013 or 2016. Updated the Sales Report for tutoring.xlsx.